Railway Show. 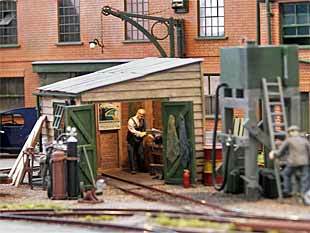 He filed this report about four excellent small layouts on display there. The header refers to the age of the layout, not its builder! 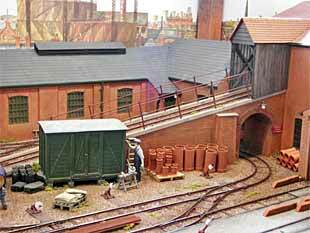 The Brickworks recently celebrated its 10th birthday, and it has often been exhibited and written up in the English model press. Yet Arthur Budd’s O-14 [On2] layout in 7mm scale, as seen at York, is still fresh and inspiring.Emrys Hopkins’s notes include the following information: “The track, most of the rolling stock and three of the locomotives are built from Roy C. Link kits. 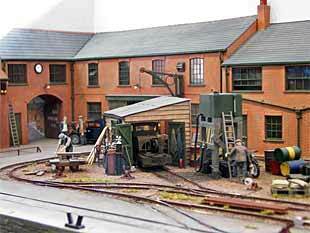 The other locos are from Wright Lines and Nonneminstre kits. The buildings are scratch-built from plasticard [styrene], Howard Scenics brick-card or balsa and ply, and everything is painted and weathered using the techniques described by Martyn Welch in his book ‘The Art Of Weathering’. To see why this little layout is perennially young, just scroll down and enjoy a selection of Emrys’s marvelous photographs, taken at the York show. Newton Halt is a “newish” layout in OO9 [HOn30]. 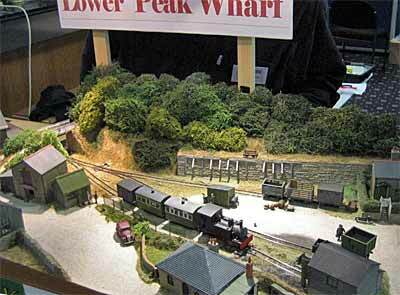 It made its debut at the Chelmsford Model Railway Exhibition in October 2005, where it won the Narrow Gauge Competition. We featured the layout in this Scrapbook at that time. 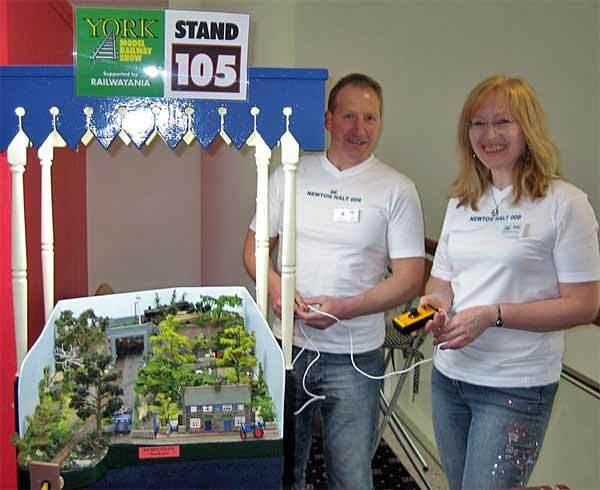 At York, however, Emrys was able to photograph its builder-operators — Andrew McMahon (left) and Sheila Perry in action. For more information about the layout itself, you might turn to the Scrapbook page linked above as well as to Andy’s website. As an incentive, here’s a closeup from Emrys’s camera of this 30x20in layout. Nowhere is a barrow more useful than in a garden, and this offbeat layout in 1/12 scale (1in = 1ft) actually has two garden railway models! 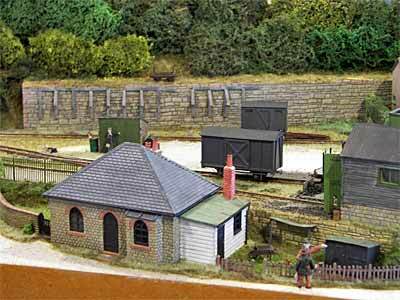 Mr Cholmondley-Warner’s Garden Railway was constructed by the Raven Group (Norman Raven and his family). As their exhibition notes point out, “It represents (using N and Z scale stock) the garden railway at Mr Cholmondley-Warner’s house. 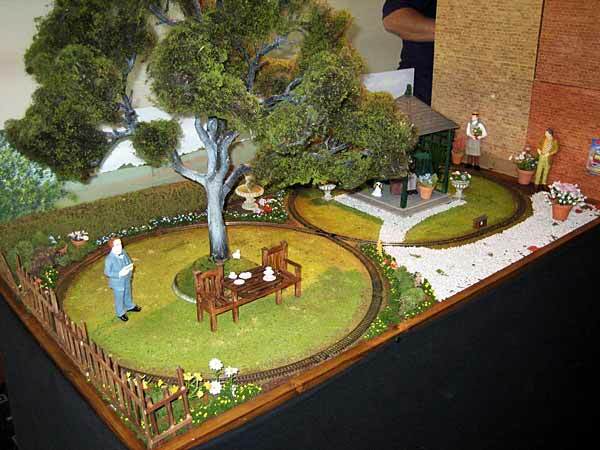 Although the layout is built as a bit of fun we have adhered to the concept of a garden railway in scale with the overall 1/12 scale of the buildings, surroundings and people.“Mr Cholmondley-Warner has opened his garden and its railway to the public to support his village fair. There are two railway systems. The first is the ‘live steam’ 5 inch gauge which is represented by the N scale stock. The second is G scale represented by the Z scale stock. Taking the overall scale of the exhibit as 1/12, N gauge represents near enough 5 inch gauge while Z scale is just a little larger than the 1: 22.5 of G scale. 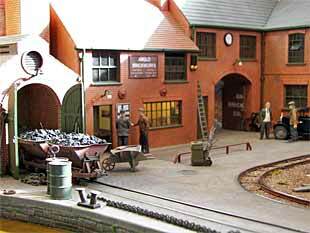 John Bruce’s OO9 narrow-gauge layout, Lower Peak Wharf, portrays a far simpler time. It was originally built as a horse drawn line to take the stone from the old quarry (off scene on the right) to the canal (off scene on the left). With the coming of a standard gauge railway nearby this link was replaced with a new line linking the village and its quarry to the rest of the railway network and, of course, the greater outside world. In due course some carriages and other goods wagons were bought to better serve the local community, which of course was mostly employed by the Quarry Company anyway.Now — sometime in the late 1930’s — the quarry has closed and the train runs a couple of times a week on market days to the nearby town. Most people still use the train but one day it will be replaced by a bus and the line will become a part of our industrial history. John Bruce is no stranger to this Scrapbook. His predecessor layout, New Sarum, was featured earlier this month. It’s a pleasure to explore the very-different English rural atmosphere of Lower Peak Wharf.